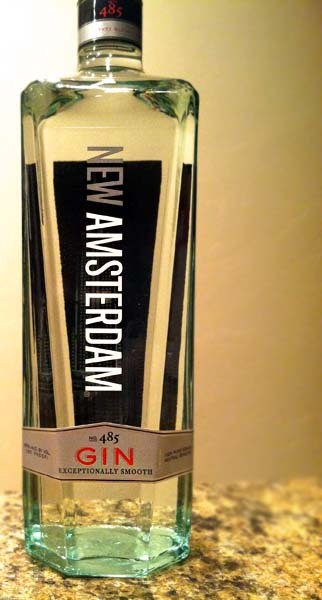 With a name like New Amsterdam, I thought this gin would be produced on the East Coast near the New World Dutch settlements. But alas, 'tis not the case. Today's review is of a gin produced in Modesto, California. Shocker. Not that it matters all that much. This isn't some fancy pants gin, merely another ~$15 bottle, but hey that's alright. New Amsterdam Gin pours crystal clear as gin should. It smells a lot like a regular gin that has been subdued. Some juniper, citrus, and vague hints of pepper and other spices. Tasting this gin, it is remarkably smooth and clean tasting, with very simple yet forward orange and lemon notes, followed by only hints of spices and an odd lack of juniper taste. All in all, an interesting take on gin. This definitely isn't your old school London Dry Gin by any means. Much of the strong herbal and spice notes gins typically have are replaced here by citrus flavors, placing the typical gin characteristics tucked back in the corner. Fortunately, this means it mixes quite well with orange juice or grapefruit juice. I also tried it in a dirty martini where the lack of kick from juniper and spice became very apparent and just didn't work that well. Drink This: if you want a gin under $20 for mixing into fruit-centric cocktails. Don't Drink This: if you're looking for a classic gin worthy of a martini. Check out all my other gin reviews HERE. Actually a lot of Dutch in California.